Welcome to the second week in Kindergarten! After this week I can easily say, I love Kindergarten and I am having so much fun.. The play based learning that we are implementing has been a learning curve for me, and I am definitely seeing the learning happening. This week we were learning about the letter A, I am not a real fan of 'letter of the week', but to ease our junior kindergarten students in, we are starting slow. We will continue on a letter of the week until I am comfortable with the knowledge the children have after learning four or five letters. Below are some activities and ideas that were a success this week. Each morning we have a quick morning message, this was Monday's message. We made a list of 'A' words together and I had the students help me write this list on the chart. I laminated all the letters to create play dough mats for the students. The students have been using them sporadically and I must remember to encourage them. The wonderful ECE that I work with created alligator A's! The students cut and decorated. We were creating A's with snap cubes, pipe cleaners, popsicle sticks and using play-dough stampers. We let the students decide how they wanted to create their first 'A' of the year and we had great ideas. I strongly suggest letting students choose the materials they want to work with. One of our students is working in her ABC book which is the same one used in the Levelled Literacy Intervention program. Students drew pictures of objects that started with A and then printed the word. We had a chart of A words that we created that the students used to help them. I really wanted to start Food Fridays! So this week we asked each child to bring in an apple. We did our apple wonderings, and compared shapes, sizes and colours of apples. The students loved it and we did our big crunch of the first bite and video taped it so we could see and hear the crunch. We created a letter box, that we put items that start with A in, and the students had to guess what objects were inside the box. 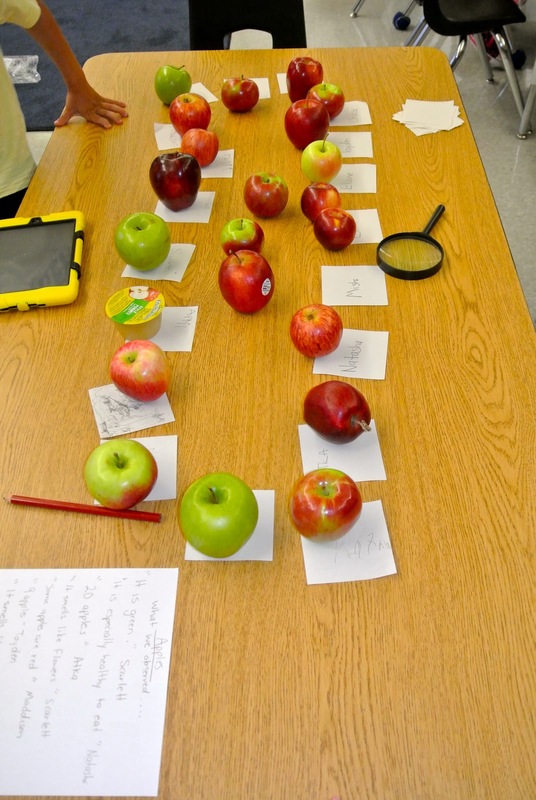 One student at a time came forward and chose an object so the other student could not see. This is a great activity for inferring as well. I will use the box each week and keep a few objects of the previous week inside to help review the letters. Our Read-Aloud book for most of this week was One by Kathryn Otoshi. This is a lovely story about how the number 1 stands up to the colour red who is not being very nice to the other colours. The students loved it so much we read it two days and then did a few activities. The students are creating the coloured numbers in the book, they practiced making the numerals and colouring them in at our art centre. Each student got their own number one and drew things that were important to them. They LOVED doing this, and everyone came to this literacy centre to make one, as we went through our day. We also came up with our first inquiry of the year which I will share on Sunday!I hope some of these ideas help my fellow colleagues, and friends. Enjoy!